Camp for €18,- a night at Campsite Domaine de Merlanes in low season with CampingCard ACSI. 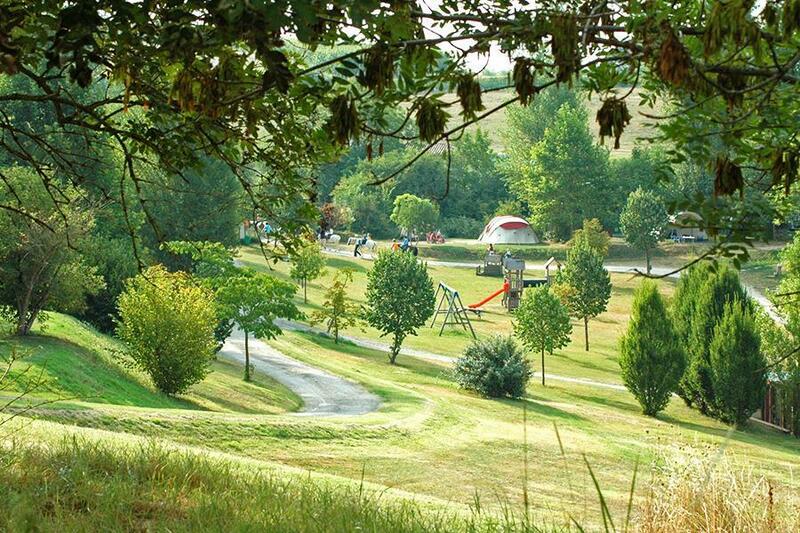 Campsite Domaine de Merlanes, located in Molières (Tarn-et-Garonne), is a campsite with 51 touring pitches. With your CampingCard ACSI you can camp on one of the pitches during the following periods: 27-04-2019 - 06-07-2019 and 24-08-2019 - 14-09-2019. At this campsite you can not only use your CampingCard ACSI for inexpensive camping, you can also use your ACSI Club ID (as an alternative ID). Campsite (35 ha) in valley, large pitches, for those seeking peace and quiet. Dutch owners, great amenities: heated pool, terrace, bread, farm and stables. A good base for Moissac, Montauban, St. Antonin-Noble-Val. Off the beaten track, but well worth the effort. The owners have transformed a valley with so many different trees that you might feel you're in a park! The lime trees were in blossom, and their scent filled the air. Peaceful and sooo relaxing! Spacious children's play area, but few little ones to use it. Excellent pool area, catering for all ages and abilities. We were initially doubtful of the somewhat "airy" toilets! Later on, during a heatwave, they proved their worth! There were other, immaculate facilities near the pool. This must be the very best camp site we have ever seen in France. We loved the huge emplacements and the fact that there is sufficient space between ourselves the nearest other campers. The site has been superbly landscaped by the Dutch owners. The welcome was second to none and a free drink on our first evening set the scene for several enjoyable days. We could not understand why there were never more than two other campers there during our stay. It might be because this site is well out of the way and there is not a great deal to interest people in the immediate vicinity. That did not bother us as we were content to simply enjoy the sunshine and peace and quiet. There was just one disappointment in that every evening some dogs away to the West of the site started barking madly every evening around 8.00 and kept it up often until the early hours of the morning. It became such a nuisance that it was almost a relief to leave. Exceptionally quiet campsite with huge pitches. Hard working owners/staff very welcoming and included a free welcoming drink. Food very good. Showers hot as was the washing up water and everything very clean including the pool heated to 28C. If you want a campsite away from it all in lovely countryside to chill out this site ticks every box, but approach is on narrow roads but we never met any traffic. Highly recommended. A wonderful site with a very friendly owner. Wonderfully large pitches. Fantastic for a relaxing holiday. We had 5 days here at the end of May 2014. For us the pitch was the star, very large, flat, peaceful and picturesque. The reception, bar and pool are on a hill with sites spread down the slope. There is a modern unisex toilet block next to the bar, convenient for the top sites. There are 2 toilet blocks lower down the slopes which although dated are adequate but very open. All are very clean. It is a well run site with friendly, helpful Dutch staff who speak good English. The village of Moiliere is not really walking distance over narrow roads but has 2 nice bars who do standard French menus. The surrounding area is pleasant and we would visit again. A fantastic site in the heart of the French countryside. We initially booked in for one night and ended up staying for four. Most of this time we had the site to ourselves apart from the delightful Dutch family who ran it (and the llamas, miniature ponies and other animals dotted around the estate). Free wi-fi was available in the bar area and we were not hassled to buy a drink whilst sat there (but, of course, we did). In fact we got a free welcome drink upon arrival. There were two toilet blocks, one was adequate (in the camping field) and the other was excellent (near the bar and pool area). this second block was very useful after taking down our tent in the torrential rain that was dogging Central France at this time. The pitch sizes were all enormous, more than adequate for our large family tent. This is very useful when living out of a car for a period of time. The pool area was beautiful (although not used by us because of the afore mentioned rain) and both pools were heated. Definitely a site I would return to if in the area and I have already recommended it to several people we have met on our travels. After over 20 years camping in France we decided we were getting a bit jaded ,till we came here. This is maybe the finest site I have been to: the open spaces, the huge pitches, the heated toilet block, the heated pool (we went in September). The staff were knowlegeable about the area and were very helpful, nothing was a problem to them, I felt that all people involved were commited to the visitors enjoyment. We have camped in France for over 25 years and can say that this is the finest site we have visited. The staff are pleasant without patronizing and are very knowledgeable about the area. Pitch sizes are huge (up to 300 s m) with plenty open space that could have doubled the number of pitches (61). My favourite site this year. Beautiful trees and grass areas kept in superb condition. The swimming pool heated to a comfortable temperature. Staff are friendly and they have made a wonderful site here. Would you like to book Campsite Domaine de Merlanes or request more information? You can do both using the information below. D820 Cahors-Montauban. Exit Montpezat-de-Q (D20). Just before Molières turn left towards St. Christophe. Follow camping signs. From Toulouse exit 60 (Montauban-Nord). RN20 to Réalville then to Molières, then follow camping signs. CampingCard ACSI will send your information request to "Campsite Domaine de Merlanes".